Important: If you have undergone any previous treatments, especially with glycolic acid, these treatments must be completely stopped at least one week prior to using Cosmelan MD® Depigmentation treatment. The CosmelanMD® Depigmentation treatment is only administered in a medical office and support products must be continued at home, on a daily basis, according to the guidelines indicated. The treatment must not be interrupted under any circumstances, during the whole time prescribed. As melanin production is being suppressed, failure to maintain proper use of sunscreen and your support products may allow reactivation of pigment production cycles. Cosmelan MD® Depigmentation is NOT TO BE COMBINED with any other depigmentation treatments. Follow up visits are recommended 15 days after the beginning of treatment, and 30 days after, and a follow up treatment are revisit every month thereafter. Clean skin with water and neutral cleanser. Evenly distribute the cream to form a face mask, applying a thicker layer over blemishes gradually thinning out over the rest of the face. After the action time has elapsed, the patient must remove the mask with water and a neutral cleanser. During the first three to five days of the treatment, the skin will peel and be red. If the skin is very sensitive, the patient may experience an itching feeling. Slight burning and tightening of the skin is also absolutely normal, especially during the first few hours right after starting the treatment. To relieve these problems, it is advisable to apply the mesoestetic® Hydra-vital factor K whenever necessary. The reddening that occurs on the face after applying the mesoestetic® Cosmelan MD is expected and is normal. Flaking and peeling will occur on all skin types (and more intensely in photo types I and II) between the second and third day. In this case it is advisable to apply the mesoestetic® Hydra-vital factor K cream, repeating this every two hours on the day when the flaking is most intense. After the fifth or sixth day, your skin will be calmer and you should notice some initial fading of pigmentation. When peeling is complete you will notice much smoother skin. Clean Face completely, every time mesoestetic® Cosmelan 2 is applied. 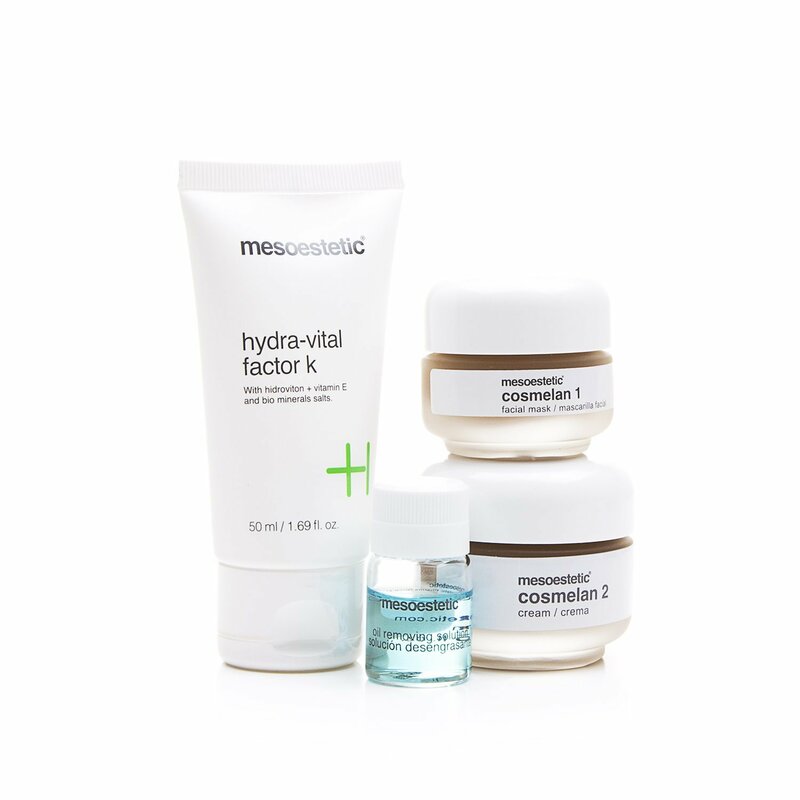 Apply a thin layer of mesoestetic® Cosmelan 2 all over face mask style, with a light, circular movement. Apply mesoestetic® Hydra-vital factor K to the face and neck with a light, circular motion 15 minutes after applying mesoestetic® Cosmelan 2. Use daily.